It was an experience I had waited my entire life to have. Ever since I was a little girl, I’ve always wanted to interact with tigers. 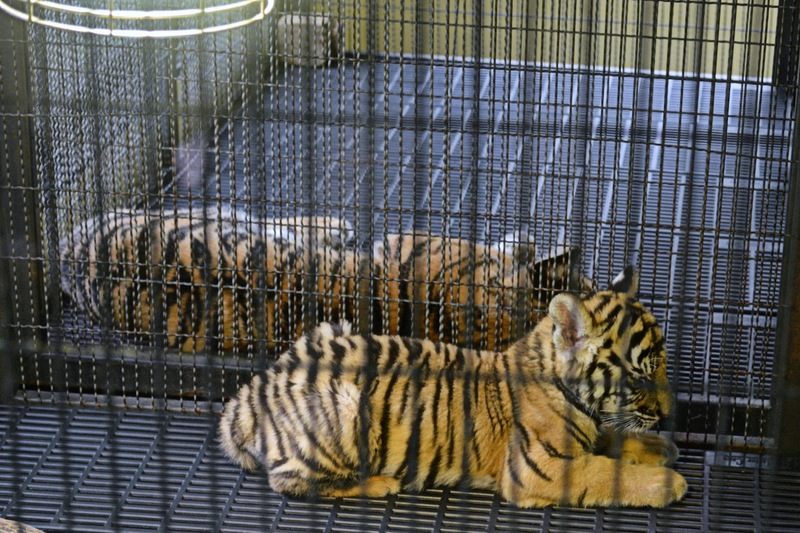 I had heard that most of the tiger sanctuaries in Thailand drugged and mistreated the tigers. Those were not the types of establishments I wanted to spend my money on. Just like the elephants, I sat and did hours of research until I found a tiger sanctuary that appeared to be a reputable company. I wish I could say that my tiger encounter was as magical as the elephant, but I was gravely disappointed. When doing my initial research, I found many people confused Tiger Temple and the Tiger Kingdom. It was effortless to find negative reviews about Tiger Temple, but often the Tiger Kingdom was used interchangeably. Eventually, I was able to find various blog posts from individuals who had volunteered at the Tiger Kingdom for an extended period, and according to these sources, there were no drugs given to the animals, and there were no signs of abuse. After this research, I convinced myself that it would be ok to visit the Tiger Kingdom. We booked a tuk tuk to take us from the guest house to the Tiger Kingdom. This happened to be one of the only times while in Chiang Mai that it decided to pour. With the back of the tuk tuk open, the rain somehow managed to wiggle its way onto us. However, the cold rain was refreshing from the hot, humid air. About 30 minutes later, we arrived. My excitement could not be contained. I was finally about to pat a tiger! We lined up to choose which animal encounter would best fit our budget. If I had the money, I probably would have cuddled all the tigers but, alas, I am a broke a** backpacker, so I had to choose. We opted for the small tiger. If the tiger got angry, it wouldn't completely rip our faces off. Unfortunately, I don't think travellers insurance covers accidental damage due to being mauled by a tiger. After purchasing our tickets, we were told the wait would be approximately 1 hour until we would get to see the tigers. What?!? How am I possibly able to contain my excitement for another hour? Luckily, or unluckily, you're able to walk around the grounds of the Tiger Kingdom while waiting. This is where the heartbreak started to set in. 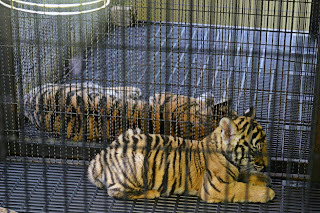 Walking around the grounds, you are confronted with larger tigers encaged in a space that is clearly too small for them. Many were pacing back and forth, with extreme looks of anxiety across their face. I started to become increasingly frustrated that I had spent so much time researching only to see the tigers in such distress. Awake and ready for some pats! It was finally time for our tiger encounter. My heart melted. The tiny, little tiger was so adorable! All I wanted to do was give her cuddles. Once in the area with the tigers, you're allowed 15 minutes to take pictures and interact with them. Please keep in mind; tigers sleep a lot throughout the day. Just because they're sleepy doesn't necessarily mean they're drugged. Our little girl did not appear drugged at all. Though tired, she was responsive to our pats and the trainer's commands. She let out a couple of big yawns and some, what sounded like purrs of contentment when we were giving her pats and scratches. Please keep in mind; particular rules must be followed when in the room with the tiger. Please follow these rules to avoid being injured. While it was incredibly tempting to want to pick her up and give her a massive cuddle, I opted for the safer options, so I didn't go home being mauled by a tiger. Overall, I was grateful I got to experience a close encounter with tigers. Would I do it again? Probably not. I've begun to do extensive research into animal tourism, and it makes my heart hurt. However, if you've always wanted to have a close encounter with a tiger, I highly suggest doing your research before going. Had we gone to the Tiger Kingdom before the Elephant Sanctuary, my opinion might have been different. 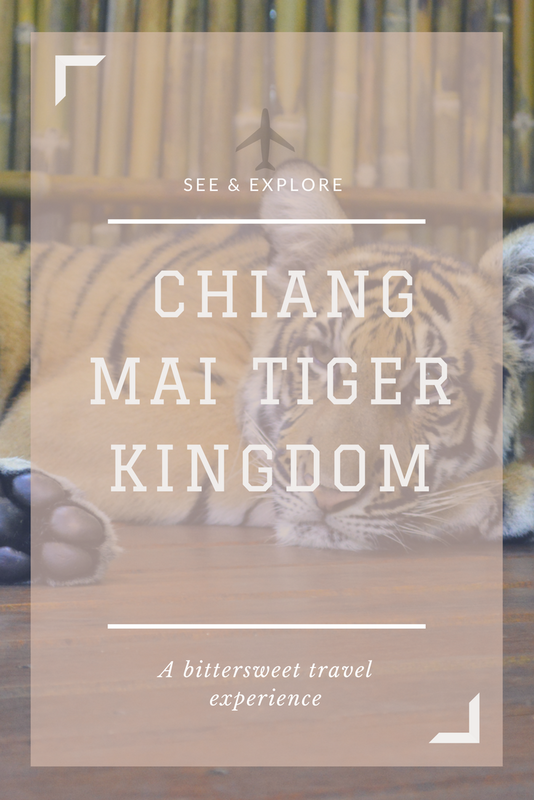 If you are choosing to meet some tigers while in Thailand, I would thoroughly recommend the Tiger Kingdom over the other options. Have you ever had an up close encounter with an aminal? Have you ever been to the Tiger Kingdom? Share your experiences in the comments below! oh wow! How exciting! Watching the tigers through the glass is always one of my favorite parts of a day at the zoo. They really are magnificent! I have to say that you are very brave. I wouldn`t dare to go inside a cage with tigers. I faced a similar conundrum when visiting Thailand and did opt to go to Tiger Kingdom in the end. We spent 30 minutes in the baby tiger enclosure and they were adorable, there were about 5 of them crawling all over us and rolling over - seemingly happy enough! That was a few years ago now and since reading more into animal tourism it is quite brutal and certainly unnecessary just for our entertainment in most cases!! Thanks for sharing!